For guide pulleys for FireLine: mill a notch in the ball bearing with a lathe. This should be a small solution without additional guides. I'm a bit lost about what's meant by crossing lines and equal angles, can someone clarify? If the line is not straight on the shaft, the line is in an oval form. So the line is a bit longer. But this longer line is no problem, because it can be corrected by software. But it should be the same factor constantly, which means same angle and the shaft should have a precise surface. Crossing the line results in in a longer line also (and can also be corrected by software), but has the advantage of a bigger friction and addresses the problem of spinning (go loopy), especially good for material like steel wires. The problem of spinning can be addressed by higher tension, but this results in requirements of a higher mechanical construction stability. And the wire could break at high tension. Steel wire btw is not optimal because it need a high minimum radius for bending. I have a steel wire of 1 mm diameter and my seller told me to have a minimum radius of bending of 10xdiameter, so the radius should be 10 mm = bending wheel diameter 20 mm. And in 3D printing you bend it many times when you print several hours, so it may break. So in most cases FireLine or archery line is used. Edited 7 time(s). Last edit at 05/21/2018 02:46AM by JoergS5. IDK if its feasable, but you see the angle of the line stays the same while spooling up/down. It would require a special carrier with a line-clamp which has a DOF in north/south direction. Edited 1 time(s). Last edit at 05/21/2018 03:11AM by o_lampe. You can additinally fix the line in the middle of the spoolers, so there is no spinning. If you don't fix the line, you can you your construction is a closed belt system, if you need that. (hmm maybe not fully, the direction of the wire changes in the middle). I thought about how to move the spooling. One possibilitiy is to use the stepper which moves one axis: if you connect it to a gear with 1:10 or so, you could use that to move the axis up and down parallel to the main stepper movement. CoreXY maybe not possible because the steppers don't move X and Y independently, but there are systems where this is the case. btw I meant something different by crossing: I meant multiple layers on the spooler. I am building a printer with Dualwire-Gantry system and will try some of your ideas. Edited 1 time(s). Last edit at 05/21/2018 06:42AM by JoergS5. Edited 1 time(s). Last edit at 05/22/2018 03:37AM by o_lampe. I admit, I saw your picture only. Your video was very interesting. Your point of axial forces was interesting: if axial forces are high enough, they will pretect against the lines getting stapled. If there are less then say 10 lines, there will be no need for moving the z axis, I expect. Next I will compare FileLine with Kevlar and a steel line. Bearpaw 452 is very expensive, I am still thinking about whether it's worth buying. At the risk of sounding stupid/blind, where's the video? The only issue I see with this design is a simple, slop free way to fix the carriage to the string, yet still let the fixture point move with the string as it travels axially along the drum (if that made any sense?). Too little clearance in the fixture mechanism and there will be too much friction for it to move freely and not drag the spectra line "off course", too much clearance for free movement of the fixture point and you get backlash. But yes, this would lead to a constant steps/mm. Since the spectra is at a slight angle there is a cos/sin term in there but it is a constant since the angle doesn't change and can be calibrated out, you can get rid of this entirely by offsetting one pulley axially so one line of the spectra is straight (the other will be at a steeper angle) and therefore no trig term. The idea of offsetting the idler side is intriguing too. I just noticed, the carrier are drawn on the wrong side, but the idea stays the same. Edited 1 time(s). Last edit at 05/23/2018 12:21PM by o_lampe. If you have a small diameter of the wire or a big distance, the angle will be low and you may not need the construction. You will have a bit of backlash at the pivot points (ball bearings?). You can use something like that: [www.youtube.com] turned, so the ball moves up and down, but it will have backlash also. To me, I don't think there can be a good solution to a "floating" fixture point that doesn't have a fair amount of slop. Any bearing/pivot/joint you add will increase the slop. Also, that design does introduce non-linearity since the fixture point travels in an arc, so it moves relative to your carriage along the direction of travel and not just perpendicular to it. This may seem like a stupid idea, but what if we "synchronize" the travel of the string on the spool with the travel of the carriage. So as the carriage moves towards the spool, the string is wound so that it moves closer to the notch (ridge?) at the center of the spool. This way you're shrinking all sides of the triangle simultaneously and keeping the angle the same, so any trig error is constant and can be calibrated out. This also eliminates the need for a floating attachment point on the carriage. The only slightly tricky part is figuring out the "pitch" the string needs to be wound at so that it moves towards the ridge on the pulley at the correct rate so the angle stays the same. Might be more effort than it's worth since I don't know if we can wind the string precisely enough. Perhaps winding it into the threads of a threaded rod/acme screw to keep pitch accurate? EDIT: while this does solve the linearity issue in steps/mm, it doesn't solve the issue of non constant string tension since the length of the string will still change (I think?) as the carriage moves. This is a secondary issue of the triangulation error that we set out to solve. EDIT2: I'm starting to wonder if fixing this triangulation error is even worth it. It's not like 3D printers are super precise, the error might not even be noticeable. EDIT3: with o_lampe's crossed line idea, the string length (and therefore tension) should be constant. That only leaves the issue of getting the winding pitch correct. Edited 3 time(s). Last edit at 05/23/2018 09:28PM by Trakyan. One Aspect I thought about is: every mechanic has its tolerances and imperfection. 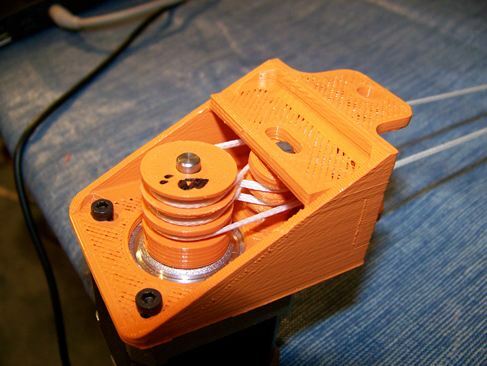 As an example, the 3D printed pulley will have different diameters. How is the relation of this tolerance in respect to the angle imperfection or the other backlash/angle/... problems. Or as another example, the stretching effects of the wire between the pulley or when you wind it, length of the wire will be different . - how much does it costs and does it augment complexity? For our results on this thread, I am not sure about the different impacts. @o_lampe: please don't misunderstand: I think your ideas are great. But I wish some additional measurement how much the ideas contribute to precision. Edited 2 time(s). Last edit at 05/24/2018 01:21AM by JoergS5. For big printers you will need thicker wires, e.g. the Sli3dr creator will switch to wire for a tension of 60 kg. In my calculation this means FireLine above 0,5 mm diameter. I plan to use wire for a small printer (MGN07 linear guides and Bowden) and will try FireLine 0,1 mm, where angles and tensions should not be a problem if the stepper pulley is large enough. ... for my first DIY XY-plotters (and later CO2-lasercutters), I've used "super-flexible" steel wires with 49 single strands with diameters of 0,3mm for the lightweight to 0,7mm for the "heavy duty" types - they were really strong, but could resonate with high acceleration forces and length >500mm. Tried then with Kevlar and some steel-core-glass wires too, but the steel types were the best. What sort of drive system did you use VDX? A pulley with the line anchored to it or just relying on friction to run it like a belt? I don't fully agree. The anchored line wouldn't need such high tension. It would have to be higher than the belt tension to eliminate line-stretch and ringing. It all depends on gantry weight, of course. This may seem like a stupid idea, but what if we "synchronize" the travel of the string on the spool with the travel of the carriage. So as the carriage moves towards the spool, the string is wound so that it moves closer to the notch (ridge?) at the center of the spool. With a fixed connection between carrier and string, the string would then always have to be in the center of the pulley? I don't see clearly, what you mean. ... simply friction -- smooth aluminium cylinders with 20 and 40mm diameter (X direkt drive, Y with tackle) and 3 loops around. Edited 1 time(s). Last edit at 05/25/2018 05:06PM by VDX. Thanks for sharing the details, Viktor. The reason for the high tension was, he wanted to reduce stretching of Spectra line. I am thinking about using steel again. A high 20-40 mm diameter makes sense to not destroy the wire. 20mm is too small for most steel wires. Also, doesn't spectra have lower stretch than steel per unit area? Maybe it was mass/density, can't remember. The string can leave the pulley at an angle, I'd love to draw a picture but I'm working the majority of the weekend, I'll see if I can draw it next week. The general idea is, as the string spools on/off, the end of the string coming onto/off of the pulley moves axially along the string (looking at your diagram, the string leaving the pulley doesn't always leave from the same location, that location moves as the string winds off/on). Usually this movement would change the angle the string leaves the pulley, resulting in a changing trig function, giving us non linearity. Now lets say the pulley is turning so that the string that's leaving the pulley moves towards the anchor in your diagram (the middle of the pulley). But if the carriage also moves closer to the pulley, it can stop that angle from changing. It's just a matter of making sure the string travels along the pulley (we can set this rate by using a threaded pulley, forcing the string to unwind at a set pitch) at a rate proportional to the movement of the carriage so the angle is constant. Constant angle of the string leaving gives us a constant for the trig function, which means a linear and (better!) constant steps/mm. EDIT: I might have made a happy little discovery which simplifies things further, I'll have to wait till tonight to confirm though. Edited 1 time(s). Last edit at 05/25/2018 06:54PM by Trakyan. 20mm is too small for most steel wires. ... 20mm/40mm was with the "super-elastic" 0,3mm wires -- for the 0,7mm ones the diameters were 35mm/70mm. Also, doesn't spectra have lower stretch than steel per unit area? Maybe it was mass/density, can't remember. If I use one pulley instead and take 5 windings, the result should be the same with regard to friction or even higher because the whole pulley is used. What is the advantage of the 2 pulley solution? I'm not sure what that solution does. And unless both of those pulleys are driven, only the windings on the motor pulley contribute to friction which will stop slipping. Maybe the second pulley, which is not driven by the stepper, shall increase the tension and as an effect the friction. Edit: no, I think it's not the reason, because the tension should diminish and balance out with the rest. Edited 1 time(s). Last edit at 05/26/2018 05:57PM by JoergS5. From reading the thread it seems to goal was to keep the line from traveling up/down the pulley and falling off the end, while avoiding the excess wear mentioned earlier in the thread from a spit groove to guide the string. every single turn every line is rewinded by the double angle between the two pulleys. Tension works against this because the shortest distance would be without an angle and the line tries to take the shortest distance, so grooves are necessary to take the "angle-route". You could also use a ball bearing or rotating pins pushing the line down (every single line). Result is, the in and out line stay at the same high. I first thought "why not only guiding the top and bottom lines", but this would result in the middle lines being stacked. Trakyan, thanks for your comments, this helped me understanding. The construction is interesting, as you can add a tension control by changing the distance between the pulleys easily with screws or with springs. The tension is fine granular, as a tension change between he pulleys will result in a much smaller tension change at the whole line. Edited 6 time(s). Last edit at 05/27/2018 05:12AM by JoergS5. Actually, I think your tension control would be pretty coarse. Since any change in distance between the pulleys is multiplied by the number of loops. If you separate the pulleys by an extra 1mm, and there are 2 loops, you now need an extra 4 mm of string between your pulleys. That being said, the creator in the other thread said it added too much friction at this small of a scale and I think a grooved pulley would work better, at least at this scale.